What is PCI MAX 2006? 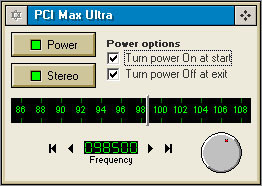 PCI MAX 2006+ is a computer card that will change the way you listen to your MP3's or other audio via PC. It will effectively change your PC into a stereo FM radio station, it is a small digital FM transmitter in a form of a PCI PC card. You will be able to play your audio files (CD, wav, MP3, real audio etc.) from your PC through radio waves directly to your household radio receiver in the next room, in the living room, across your yard, in whole block of flats....or for the entire village/small city. You need just an ordinary radio receiver to receive your signal. The included software (also available in the support section of this website) lets you set the frequency and the output power. You can either service your living room, garden or an entire community. Get rid of those pesky cables! Installation manual for the PCI MAX 2006+ is here. Installation manual for the RDS daughter board is here. Manual for the normal size LCD module is here. Manual for the miniature LCD module with LED VU meter is here. It can never be easier that this. Install this card into your PC as you would any other PC card. Install software and you're ready to broadcast! Software gives you full control over frequency and power. Additional output power and superior audio quality can be obtained by using external power source. What is new since PCI MAX 2005? - External power supply connector was moved to the back for easy access (for those with noisy PC power supplies or perfectionists trying to get the most out of their PC based FM transmitter system. Using external power supply allows for full output power and better audio quality. - All boards are prepared for RDS, a daughter board is simply plugged in (this could only be done in our laboratory before). Besides, the mounting of RDS board is now much more elegant. - Additional RF stage for increased isolation (stability) and more RF power (~350mW & 1W versions available). Low power version will be noticeably stronger than the old 2005 cards. - A LED diode at the PC backplate for transmitter power indication, it makes it possible to check whether transmitter is ON or OFF (and what the power level is). It is very handy for troubleshooting and looks good, too. 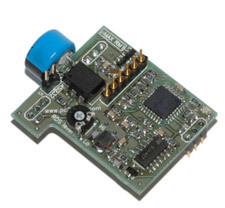 - DC/DC convertor is now synchronized with stereo encoder, which eliminates interference problems. - Power adjustment circuitry has been redesigned entirely and now performs much better. - PLL loop filter was redesigned for better audio quality. - 15KHz low pass filter was added (this was really needed as it sounds much better now). - Improved PCB layout for improved audio quality (less noise from PC). This is a more/less complete list, some changes may have been implemented, but were not mentioned here. 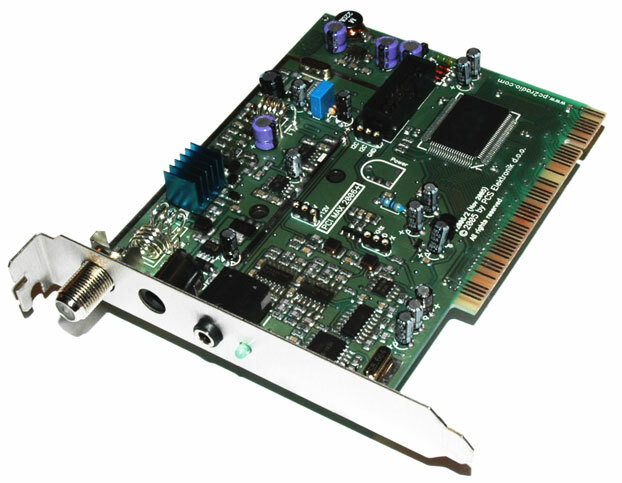 PCI MAX 2006+ has built-in balanced audio inputs, limiters, precise preemphasis and MPX filter. It can be switched to MONO or STEREO by a simple click of a mouse button. There is a phono audio input at the back of the card, which connects to the sound card via provided jumper cable. If you need to keep the particular output for your speakers, simply use splitter (awailable from radio shack or our website). Audio can also be fed to the card from other audio sources (cd players, mixers etc). Using PCI MAX 2006+ in stand alone mode, without the PC! PCI MAX 2006+ can also be used in stand alone mode! A small control unit with LCD display can be connected via flat cable and enables changing of the frequency, power and stereo mode. Power jack for the card is already provided on the board, it requires 12-13.8V DC / 1A (center +). Put it in a box and you've got a stand-alone transmitter with high quality stereo encoder, balanced inputs (only pro units have this), optional RDS (similar to RDS MAX 30+) and excellent sound. Add our 15W booster and you've got a nice 15W transmitter. Small stylish enclosures with special smaller LCD control units (required due to small size of enclosure) and 2x5LED VU meter are available and can be purchased here as well. A normal size LCD control unit, available at this moment, will not fit inside the small stylish enclosure. What is this RDS thing? Check the manual for RDS daughter board (link is above) page for more information. Basically it displays station name and sometimes song name (if supported by transmitter) and similar information on a compatible radio receiver. Very popular in Europe, less so in the US. To enable RDS functionality you need to purchase and install RDS daughter board. It plugs into a socket on the PCI MAX 2006+ board. If I use PCI MAX in stand-alone mode without the PC, can I still use PC as audio source? Of course, just plug one end of the audio cable into your sound card and the other into PCI MAX and you're ready to go! What kind of accesories are available and what can they be used for! A small control unit with LCD display can be connected via flat cable and enables changing of the frequency, power and stereo mode in stand-alone mode without a PC. Power jack for the card is already provided on the board so you just need a 12-13.8V DC / 1A (center +) power supply and you're ready to go, no PC required. A 1H 19-inch rack can be purchased as well and is perfect for the PCI MAX 2006+ and the normal size LCD control unit (holes for the LCD and keys are predrilled). There are even holes for balanced XLR connectors at the back and you can take full advantage of the balanced audio inputs. 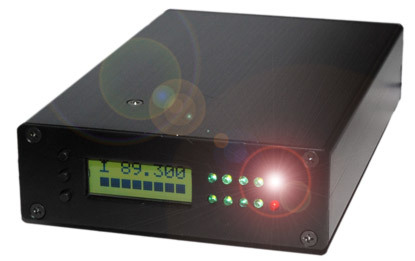 This is a much smaller control unit with LCD display and also contains two rows of LED diodes, which either function as a light show or VU meter (they change depending on sound volume). This unit was developed for a smaller box, which is just big enough for the PCI MAX 2006+ and this display unit. The entire unit is extremely compact and portable and looks great in the dark. This is a much smaller enclosure, which is just big enough for the PCI MAX 2006+ and this display unit. The entire unit is extremely compact and portable and looks great in the dark with back-lit LCD display and LEDs jumping up and down with the music. Especially cool blue background LCD displays can be ordered as well, but cost a bit more. Starts shipping in a few weeks. You can increase power by adding our 15W and 300W amplifier. 15W booster requires minimal drive and will work with any version of PCI MAX. 300W amplifier requires 1W version of PCI MAX. Please make sure you are operating in accordance with local laws when using such high-power amplifiers. Using external power supply while your PCI MAX is installed inside a PC gives your transmitter a bit more power and also eliminates any remaining noise, generated by the PC's power supply. In stand-alone operation this is of course a non-optional item as you need to power your unit somehow. Power supply will work anywhere in the world, it looks similar to the laptop power supply. The mains cable that plugs into the unit is not included as it is different in every country. It is a standard PC-type and can be purchased in any PC shop or radio shack and costs about 1 US$. Check this page for more information. Basically it displays station name and sometimes song name (if supported by transmitter) and similar information on a compatible radio receiver. Very popular in Europe, less so in the US. To enable RDS functionality you need to purchase and install RDS daughter board. It plugs into a socket on the PCI MAX 2006+ board. Starts shipping in a few weeks. - PCS0205; This is a directional antenna, it has very high gain, but transmits most of the signal in one direction only. - COMET; This is a very popular omnidirectional antenna, it has average gain, but transmits in all directions. - Dipole; Less gain than the type above, omnidirectional, but they can be stacked into 2-bay or 4-bay configurations, which are than better than any other omnidirectional antenna we have. This is the best there is for omnidirectional, if you use 2 or 4 dipoles with 2-way or 4-way harness. - MLB6600; low end, omnidirectional, small gain, but very popular due to low price and the fact that the coaxial cable is inclulded as well. - PCS0201 ; this is our new omnidirectional unit, it is somewhere in the middle with performance. The only downside is its low power handling capability, only about 2W maximum. Are you worried about loosing an output from your sound card which is now used for PCI MAX? You can reclaim it with this splitter which enables you to use your sound card output for your sound card and PCI MAX at the same time. Simple and cheap, but usefull and effective! Included antenna. Use a proper antenna such as COMET for 1W version. Supported by SAM2 and SAM3! - This unit is perfect for New Zealand and conforms to their limitations! - Digital stereo encoder on board! - Precise preemphasis on board! - DC/DC converter on board for improved Signal/noise ratio! ONLY WE PRODUCE THIS PRODUCT!